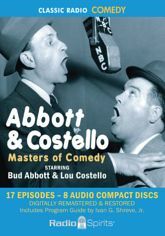 Beloved movie and television stars Bud Abbott and Lou Costello made their name on the radio, and the resulting long-running radio show preserved a rich vaudeville tradition and sensational comedy sketches. The sarcasm of Abbott's stern straight man is the perfect comedic compliment to the muffled screams of Costello's blustery "baaaad boy." This collection presents the flat-out funny misunderstandings and wacky word play you expect from Bud and Lou, and is a tribute to the legendary timing and chemistry that elevated one good natured goof and his patient pal to enduring symbols of silliness. These 17 digitally restored and remastered radio episodes from the 1940s include rare never-before-released selections, and are accompanied by a Program Guide by Ivan G. Shreve, Jr. with photographs and background information about the show.